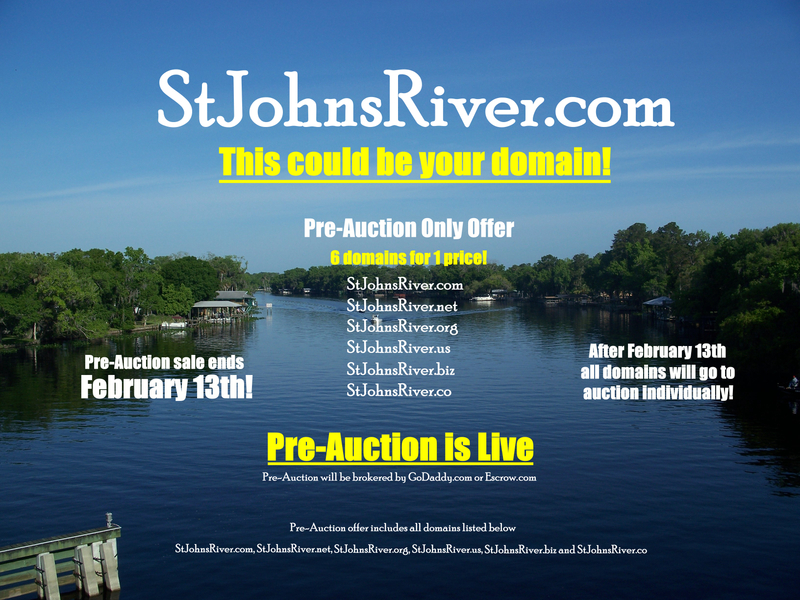 www.StJohnsRiver.com - This domain could be yours! We have been a software development corporation in Florida since 2002. Over 20 years, we have aquired all of the most important extentions for this domain. In the early days, these domains were used to promote community and river education. Now, the time has come to let someone else build their own brand. If you received a postcard, thank you. You have been invited to the pre-auction. We contacted you direct, as your business is directly related or relevant to this portfolio. Select people and businesses have been invited to place an offer for this portfolio before it goes to auction. We would rather sell this portfolio to one of you fellow Floridians! During the "pre-auction" phase, we will be accepting offers for the portfolio as a whole, all six domain names. If no offer is accepted during the "pre-auction" phase, this portfolio will be listed at auction. Any further offers will need to go through the normal bidding process as brokered by GoDaddy Auctions. Once started, a link to the auction will be listed below. ALL SIX DOMAIN NAMES WILL BE INCLUDED in the purchase price. All six domain names will be transfered to you for ONE price that we mutually agree upon. There will be no additional auction, as the sale will be final during "pre-auction". There are two options for making an offer during the "pre-auction" phase. You can go GoDaddy's Offer/Counter Offer webpage and make your offer there, or you can email us directly with your offer sent to offers@applynetworks.com. What's the difference? None really. All offers will be reviewed the same way, some people prefer to use certain third-parties. Using GoDaddy just allows us to convert the "pre-auction" to a live auction easier, in case there are no accepted bids. The choice is yours. Auction: If no offers are accepted during the pre-auction period, then each domain name will be separately listed and brokered by GoDaddy Auctions. The auctions will start on February 8th and end on February 15th. After the auctions, GoDaddy will contact the seller and broker the domain name transfer to the winning bidder. Give me my domains! If an offer is accepted during the "pre-auction" phase, to protect us both arrangements will be made using Escrow.com to facilitate the final sale and domain transfer; we will absorb the fees for Escrow.com's service. If the domains go to auction, any and all domain transfers, payments and/or fees will be handled by GoDaddy.